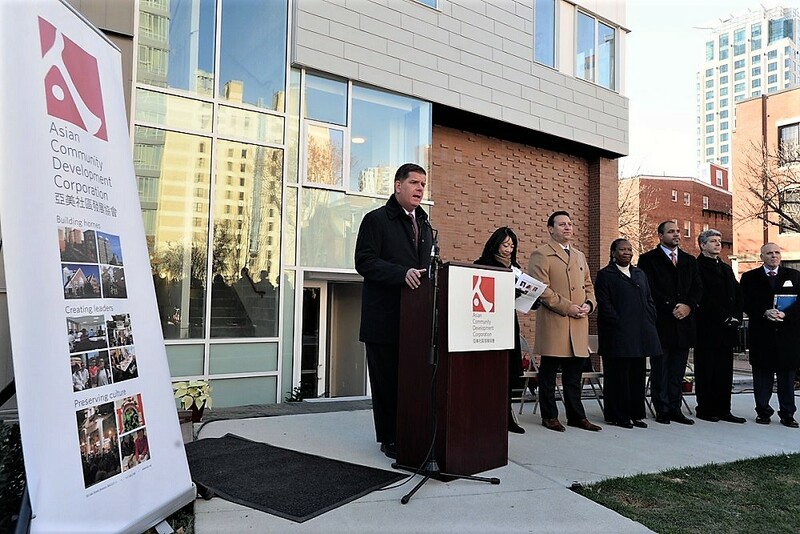 Boston, Nov. 28, 2017 – Mayor Martin J. Walsh today joined the Asian Community Development Corporation (ACDC) and Chinatown residents to celebrate the ribbon cutting of 88 Hudson Street, a development that created 51 affordable new condominiums for working families in Chinatown. 88 Hudson is Phase 2 of the Parcel 24 redevelopment project and represents the culmination of more than a decade of planning, advocacy and hard work to restore the former land owned by the Massachusetts Department of Transportation. The first phase, or One Greenway, was completed in 2015 and provided 312 units of rental housing, including 95 affordable rentals, 3,300 square feet (SF) of retail space, 5,000 SF of community commercial space and 135 parking spaces, up to 50 of which are open to the public. The 13,000 SF center open space will be shared by residents of One Greenway and 88 Hudson. Bordering Chinatown and the Rose Fitzgerald Kennedy Greenway, One Greenway and 88 Hudson represent a revitalization of Parcel 24, as the site has historically been known as a vacant lot bordering the Massachusetts Turnpike. Located four blocks from South Station, the development sits at the southern end of the Rose Fitzgerald Kennedy Greenway, Boston’s linear park that stretches more than one mile. 88 Hudson Street features 20 one-bedroom townhomes, 22 two-bedroom townhomes, and nine three-bedroom townhomes. The new condominiums will be affordable to individuals at or below 100 percent of Area Median Income (AMI). Four of the homes will be available to households earning 60 percent or less of AMI, and 42 will be affordable to households earning at or below 80 percent of AMI. The new townhomes are priced ranging form less than $200,000 to $235,000. The developer of this parcel is the Asian Community Development Corporation (ACDC), a 30-year old community-based organization, which serves the Asian American community of Greater Boston. ACDC has developed over $100 million in mixed-use real estate that is home to over 1,200 residents in Boston and Quincy. ACDC also runs bilingual financial and housing counseling and homebuyer workshops, youth leadership programs and resident and civic engagement initiatives throughout the year. “ACDC is excited that we have now added 51 new homes to Chinatown where working families can afford to live, and own their own homes without worrying about rising rent or the threat of eviction. This completes Chinatown’s vision of rebuilding of Hudson Street that started 15 years ago,” said Angie Liou, Executive Director of ACDC. “I moved to America eight years ago with my family and within six years, we were forced to moved five times because a landlord decided to sell the house or because of bad living conditions.Two years ago, I won a lottery for an affordable apartment at 66 Hudson, and that made life much more stable for my family. This allowed me to save money and become a homeowner for the first time in my life. Thank you to ACDC, Mayor Walsh and everyone for this life-changing opportunity,” said Man Li Chen, who will be moving into her affordable condo at 88 Hudson with her family soon. This project has revitalized a historic piece of the Chinatown community, bringing the entire vacant site back to productive use. The development also received overwhelming support from the community, local businesses and nonprofit organizations. The more than $20.5 million new building has been made possible in part, by a contribution from the City of Boston totaling more than $6 million, including $5.9 million in City of Boston Inclusionary Development funds and $750,000 from the City of Boston’s Neighborhood Housing Trust. This substantial City investment enabled the development team to take advantage of more than $4 million in state funding, including $2.1 million from the Commonwealth’s Department of Housing and Community Development and Housing Stabilization Funding and $1.9 million in Affordable Housing Trust Funds. Eastern Bank also provided an $8.9 million construction loan to the project. CEDAC provided predevelopment financing for the project. To date, the Walsh administration has committed more than $100 million in funding to the creation and preservation of affordable housing. Today’s announcement also contributes to the City’s preservation and anti-displacement goals, outlined in Housing a Changing City: Boston 2030, Mayor Walsh’s housing plan, and the housing goals laid out in Imagine Boston 2030, Boston’s first citywide plan in 50 years. As part of both plans, Boston has prioritized increasing the overall housing supply, with a focus on creating and preserving affordable housing.